Home > Resources > Recover Samsung > How to Recover Deleted Contacts from Samsung SIM Card? You can see people use Samsung mobile phone everywhere. Nowadays, many mobile phone manufacturers release a series of proud products and service in the market to compete with each other. And we should thank to them to make the communication and digital life easier. Although a Samsung mobile phone can make calls, send messages, take photos and more, there is a SIM card inside the phone, which can be used to save personal information like contacts, as well as sent and received messages. What would happen if you accidentally deleted those contacts from your Samsung SIM card, or lost contacts due to some known or unknown reasons? Are the contacts lost really? Could we recover the lost contacts from the SIM card in Samsung Galaxy S6/S5/S4/S3/Note 4/3? In this article, we will give you the right answer. 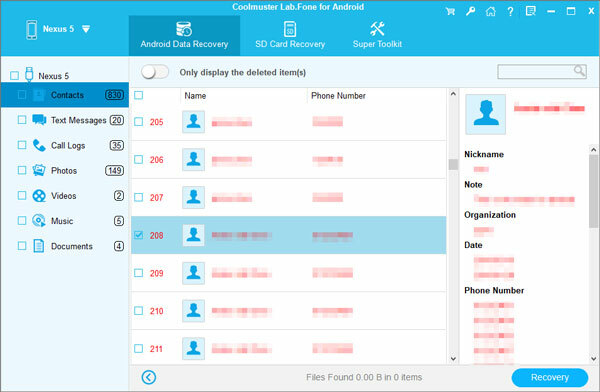 To tell you the truth, we are fully able to undelete contacts from Samsung SIM card by using third-party software like Coolmuster Lab.Fone for Android, which is a professional Android Data Recovery tool to recover lost contacts from SIM card in Samsung phone. 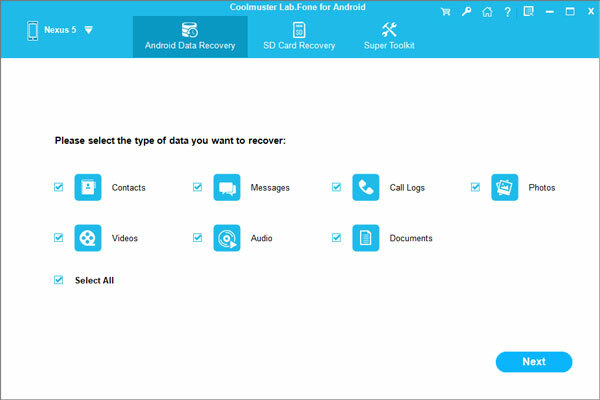 You can use this Android data recovery software to recover not only lost contacts, but also text messages, photos, videos, music and many more from Android-based phones and tablets, including Samsung, HTC, LG, Sony, Motorola, etc. Just read the following guide to see how does the Lab.Fone for Android tool work. To begin with, get the Android data recovery software downloaded and installed on your Windows or Mac computer. Here we set Windows as example. Connect your Samsung mobile phone to the same computer and enable USB debugging on your phone. Root your Samsung phone when this software asks for ROOT permission to your mobile phone, and choose "Allow" after that. Your Samsung mobile phone will be detected by the program successfully if you finish the operations above. All your Samsung phone data, no matter in the external or internal SIM card, will be displayed here in categories like Contacts, Messages, Photos, Videos, Music, etc. Choose the "Contacts" category, you can get the whole contacts list displayed. Please mark the deleted contacts you need back and click the "Recover" button on the top menu. Then, you will achieve to recover deleted contacts from Samsung SIM card with no hassle.